A new report by the Annie E. Casey Foundation finds the South has considerable room for improvement when it comes to the well-being of children. A new report looks at the well-being of children by state and finds those living in Appalachia, the South, and the Southwest are facing especially difficult conditions that put them at a disadvantage compared to their peers in other regions. Today the Annie E. Casey Foundation released its 25th annual "KIDS COUNT Data Book," looking at 16 indicators across four areas -- economic well-being, education, health, and family and community. It finds that national and state policies have led to positive changes for children, but more are living in high-poverty neighborhoods and in single-parent families than ever before. First, the good news: there's been steady improvement in the numbers of U.S. children attending preschool and a decline in the number of children lacking proficiency in reading and math. In addition, a smaller number of children live in families in which no parent has a high school diploma, the teen birth rate is at an all-time low, and death rates for children and teens has fallen due to medical and safety advances. But there's also worrisome news. After a decline in the official child poverty rate from 18 to 16 percent from 1990 to 2000, the rate is climbing again, reaching 22 percent by 2010 and remaining at about that level today. The percentage of children living in single-parent families has also risen significantly, from 25 percent in 1990 to 35 percent today. And the rate of children growing up in poor communities has increased, with 13 percent of children now living in neighborhoods where the poverty rate is 30 percent or higher. "On several fronts, we've seen the difference that smart policies, effective programs and high quality practice can make in improving child well-being and long-term outcomes," said Patrick McCarthy, the foundation's president and CEO. "But we must do much more." The report notes that big demographic changes are underway. In recent years, children of color have represented nearly half of all babies born in the United States. By 2018, they will represent a majority of children. By 2030, people of color will make up the majority of workers. The highest-ranked Southern state in terms of overall child well-being was Virginia, which came in ninth. The next of the 13 Southern states* to appear on the list was North Carolina, at number 34. It was followed by Kentucky at 35th, Tennessee at 36th, West Virginia at 37th, Florida at 38th, Arkansas at 41st, Georgia at 42nd, Texas at 43rd, Alabama at 44th, South Carolina at 45th, Louisiana at 47th, and Mississippi dead last in 50th place. They authors note that the recent recession "dealt a heavy blow" to families' economic security and point out that growing income and wealth inequality disproportionately affects African-American and Latino children, impeding their long-term success. They call for investments to help all children reach their full potential. "We simply cannot afford to endanger the futures of the millions of low-income children who don’t have the chance to experience high-quality early childhood programs and the thriving neighborhoods that higher-income families take for granted," McCarthy said. 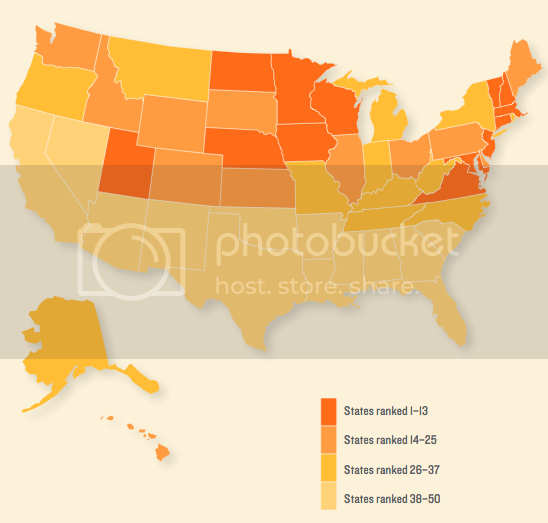 For a copy of the report and to see how your state ranks, click here. * Facing South considers the following states part of the South: Alabama, Arkansas, Florida, Georgia, Kentucky, Louisiana, Mississippi, North Carolina, South Carolina, Tennessee, Texas, Virginia and West Virginia.